I think that it was the architectural historian Nikolaus Pevsner who observed that the town of Downham Market was not as interesting as Swaffham, a comparison not particularly fair to either place. In any event, despite their proximity to each other, the two are very different. Swaffham is typical of those wealthy provincial East Anglian market towns which rode high on the hog's back during the 18th Century, and which have the architectural heritage to show for it. Downham Market has more the air of a working town which was particularly busy in the 19th Century. We are far enough west here for carstone to be replacing flint, and white brick to be replacing red brick. Downham Market's Victorian cemetery sits a little to the south of the Anglican parish church, and it is typical of 19th Century civic pride, but on a small scale, like a reflection of the town it once served. 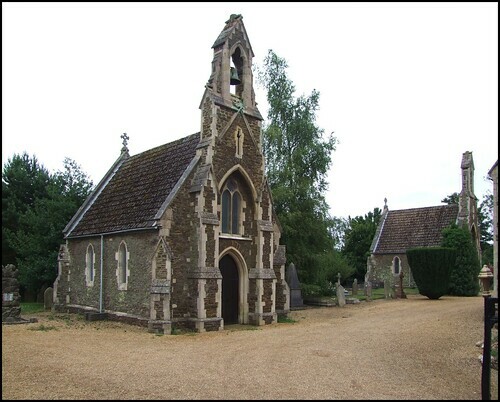 Here are the two identical cemetery chapels, one for the Anglicans and one for the non-conformists, and here is the cemetery-keeper's cottage, now a private dwelling. And above all, here are the grand memorials to 19th Century worthies, the aldermen and the factory owners, the solicitors and the bank managers, and their wives and children, their imposing monuments surrounded by iron railings, their ornate and precise inscriptions fading beneath bulging Classical urns and towering Gothic spires. To the east spread the smaller lichened stone gravemarkers of the lower middle classes: the shopkeepers and the land agents, the chief clerks and the railway officials, huddling together and disappearing into the darkness beneath the trees. And all around, invisible, are the Downham Market poor in their unmarked graves.